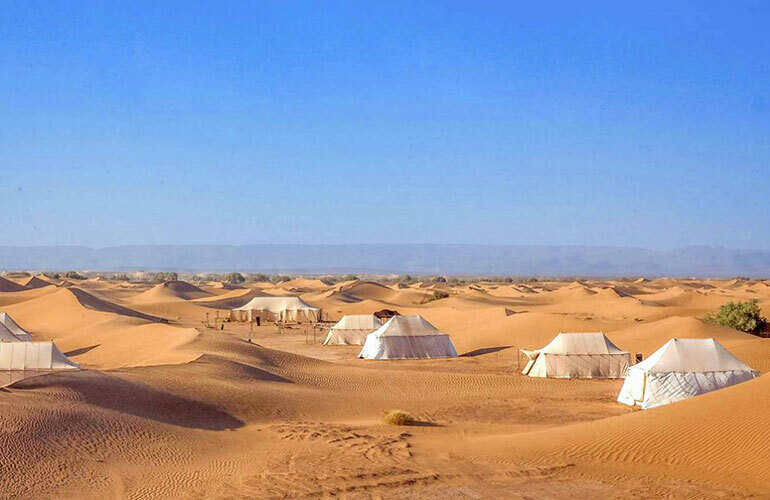 If you seriously love the desert and the promise of peace and tranquillity, then our Marrakech 4 Days Desert Tour to Erg Chigaga is the perfect tour for you. 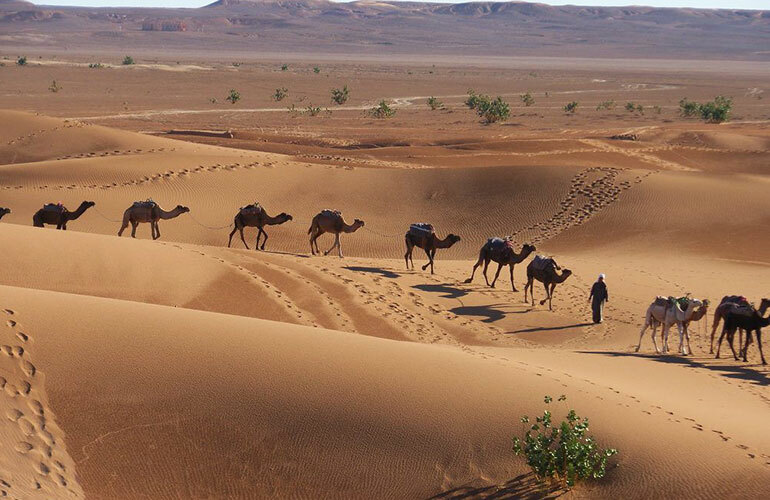 Traveling through Zagora, M’hamid and Foum Zguid, this tour is designed specifically for people who yearn for the silence of the desert. 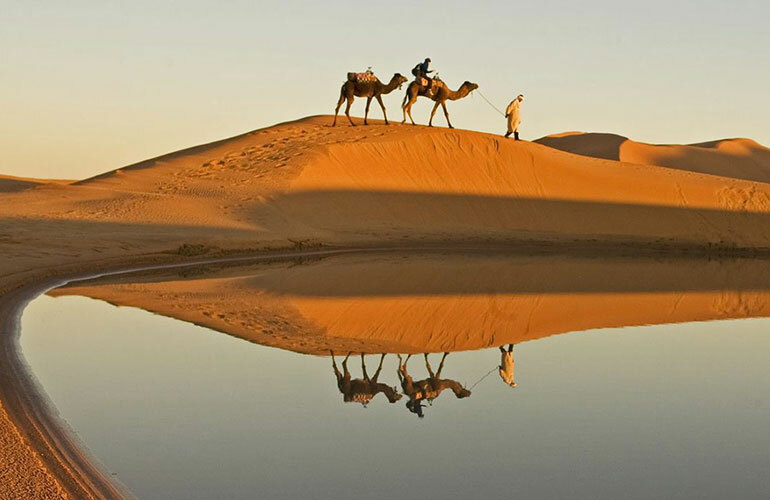 Our Marrakech 4 Days Desert Tour to Erg Chigaga helps put the hustle and bustle of the city behind you. If time is on your side, we have designed a 5-day desert tour from Marrakesh to Erg Chigaga especially for you. We’ll cross the dry Salt Lake of Iriqui. Your Marrakech 4 Days Desert Tour to Erg Chigaga will begin with a 7:30 am pick up from your Marrakesh riad or hotel. We begin our journey traveling through the Atlas Mountains via the Tizi-n-Tichka Pass and we know you’ll be spellbound by the magnificent views. We’ll make various stops along the way to enable you to photograph the amazing scenery on this trip. We’ll have lunch at Ouarzazate, then continue on with our trip to Zagora. The Draa River is next on our agenda, and we’ll discover how this river has created a huge oasis which spans approximately 200 km at the base of the anti-Atlas Mountains. We’ll pass many palm groves which provide welcoming shade to Kasbahs and fortified villages surrounded by henna plantations, corn fields, and crops of barley and vegetables. You’ll enjoy a lovely dinner and overnight stay at your boutique hotel, then start looking forward to the next exciting day of your tour! After enjoying a leisurely breakfast we’ll begin day two of our Marrakech 4 Days Desert Tour to Erg Chigaga. We’ll travel through the village of Tamagroute on our way to M’hamid, which is the end of the paved road. Sightseeing here will include visiting one of Morocco’s oldest Quranic libraries, an underground Kasbah, and the pottery factory; and it’s in M’hamid that we’ll enjoy a leisurely lunch. In the afternoon we’ll head for Erg Chigaga sand dunes and pass various oases. Because Erg Chigaga dunes are a long way from civilization you’ll soon discover that the dunes offer an overwhelming sense of peace and tranquillity, an experience difficult to find anywhere else in the world. 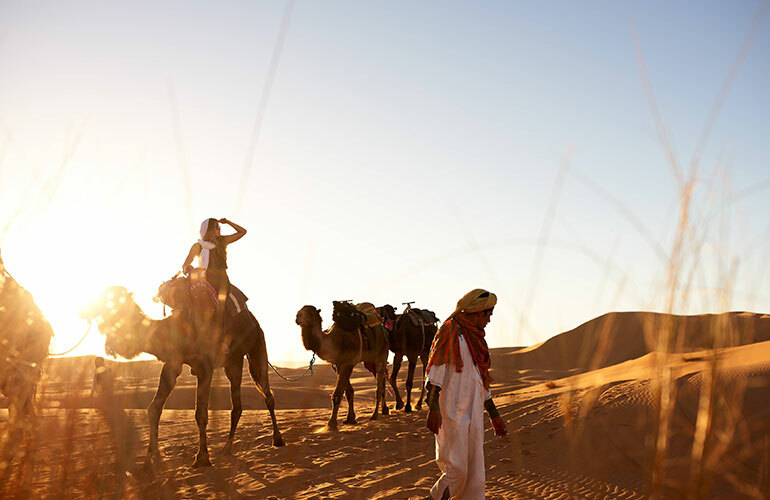 We’ll share a camel ride together across the sand dunes and enjoy one of the most unbelievable sunsets you’ll ever experience. And that’s not all! While enjoying your evening meal you’ll be entertained by local nomads, serenading you with their inspiring music. Tonight, you’ll be staying at your deluxe Sahara Desert camp site, and preparing for day three of your tour. Following a leisurely breakfast, we’ll travel 90 km through the desert and enjoy the amazing scenery as we cross Lake Iriqui, the mountains, and explore the old track of Rally Paris Dakar through to Foum Zguid. After the desert, this will be the first village we come across at the beginning of the paved road. Lunchtime, then we’ll check out some Berber carpets and rugs, arriving in Ouarzazate in the late afternoon. You’ll enjoy a lovely evening meal and a comfortable overnight stay at your hotel in Ouarzazate. After breakfast, we’ll visit the film studios known as Hollywood of Africa, just outside Ouarzazate. 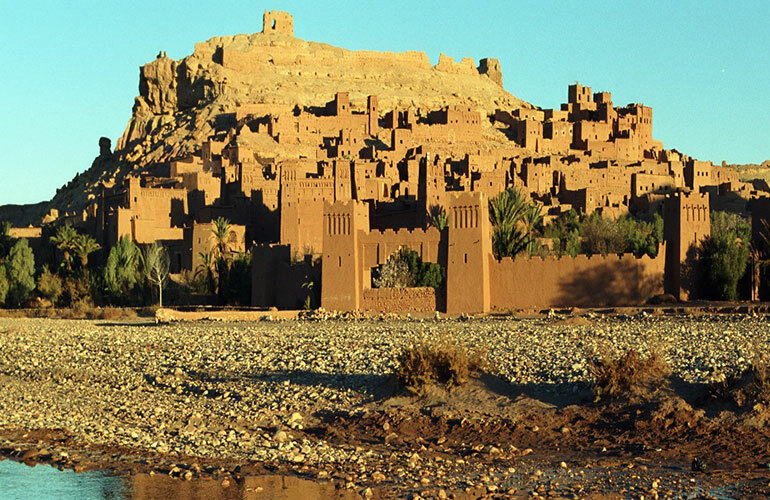 We’ll then move on to the World Heritage site of Kasbah Ait Ben Haddou, previously used as a set location for over 20 Hollywood blockbuster films. Namely, Indiana Jones, Gladiator, and Lawrence of Arabia. You’ll be free to take a short walk and explore traditional Moroccan style architecture, after which we’ll resume our travels back to Marrakesh via the Tizi-n-Tichka Pass and the High Atlas Mountains. As we travel back to Marrakesh, lunch will be served at either Ait Hen Haddou or in the Atlas Mountains, and this will be determined by time. You will arrive back in Marrakesh at 5.00pm. Finally, your Marrakech 4 Days Desert Tour to Erg Chigaga will be over when your driver delivers you to your Marrakesh riad or hotel. 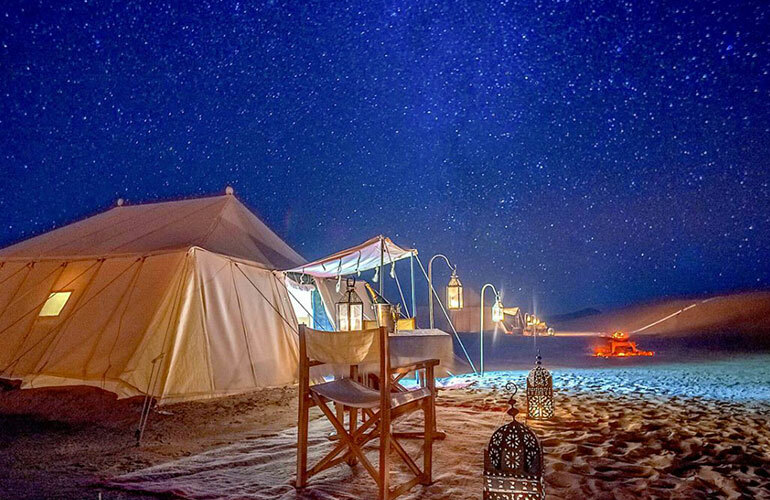 During our overnight stay at our Sahara Desert camp located in Zagora, you’ll enjoy a private tent with shared bathroom and shower. Your evening meal and breakfast are included. Please note that you can upgrade to a deluxe camp with an ensuite when booking your desert tour for an additional cost of €125 per person. During your overnight stay at Les Jardins de Ouarzazate, you’ll enjoy a private air-conditioned ensuite room. Your evening meal and breakfast are included. Drop you off at your Marrakesh riad or hotel, or the closest accessible location.